Welch Allyn’s patented Smartcuf® NIBP available with motion-tolerant pulse oximetry (SpO2) technology from Masimo® or Oximax® technology from Nellcor. Accurate readings during motion or low perfusion lead to more informed treatment decisions, fewer nuisance alarms and quicker readings save valuable time. Ideal for transport, pediatric, shivering or shock patients. 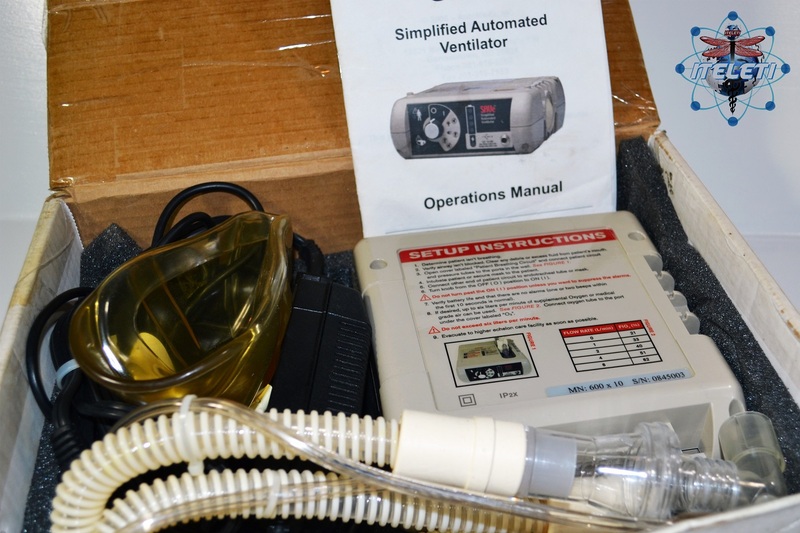 The AutomedX SAVe Simplified Automated Ventilator is designed to be quickly deployed in a pre-hospital environment by a BLS or ALS provider, a medic or any first responder with limited training. It is lightweight, rugged, hands-free, and contains a number of alarms and safety features not found in similarly priced devices. The SAVe delivers an AHA compliant tidal volume (600mL) at a fixed respiratory rate (10 bpm) which removes any guesswork and reduces errors. Comes in the Manuf. Box! Portable, easy to use, safe and cost effective the SAVe is the ideal alternative to bag-valve-masks or expensive transport ventilators. This Ventilator is in great condition and great working order. Also been kept in storage and has been handled only to maintain the devices functionality per annum. This device was last Calibrated on 01/2011. 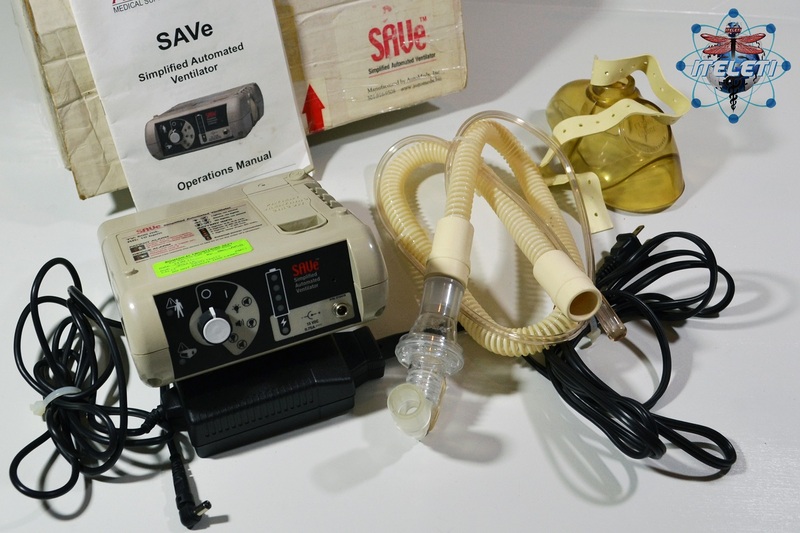 The Original SAVe Hard Case, ResQstrap, Ventilation Mask, and Manual are NOT INCLUDED (Items can be inexpensively replaced direct from the Manufacturer AutoMedx if you choose to, directly). The Ventilator itself and Listed Accessories below all come in a PELICAN HARDIGG hard case equipped with a Halkey Roberts 790 Dual Action Breather Valve (case has some light scratches and scuffs). The device addresses the dangers associated with bagging patients and frees up a responder to address other injuries, perform compressions, attend to other patients or further assist in transporting the patient. The ventilator is completely self-contained, weighs only 3 pounds and does not require a compressed gas source. It can be used with a mask or a secure airway. Low pressure supplemental oxygen can be used if desired. The SAVe will deliver ambient air for up to 5.5 hours on a single battery charge and may be recharged from a standard AC outlet. It is a set flow, time cycled, pressure limited (38 cmH2O) device. Alarms: Low pressure (disconnect), High pressure (blockage) and Low battery. The AutoMedx SAVe Simplified Automated Ventilator 600X10 (SAVe) mitigates the potential for injury, reduces operator error, complies with guidelines and improves a medical responder’s ability to perform other critical task. It is ideally suited for situations where the use of pressurized gas is inadvisable or unavailable, or where size, weight, ease of use and portability are a consideration. Forward deployed field medics, mass casualty incident coordinators within the Department of Homeland Security and EMS professionals will find the device well suited to their needs. This mobile aspirator is designed to reestablish vacuum within the pleural cavity following thoracic and cardiac surgery. The Thoracic Drainage Aspirator Gomco® 6053 and The Thoracic Drainage Aspirator Gomco® 6050 are basically the same Except the Gomco® 6053 is Manufactured Specifically for The United States Government. That is the U.S. Military basically. The benefit here is that the Model 6053 includes the integrated step-down transformer enabling the use of this Thoracic Drainage Aspirator Gomco® 6053 in areas supplied with 230 volts. We purchased these through a government procurement – bulk purchase from the U.S. Military which is a NEW, Unused, Government Surplus Medical Device. 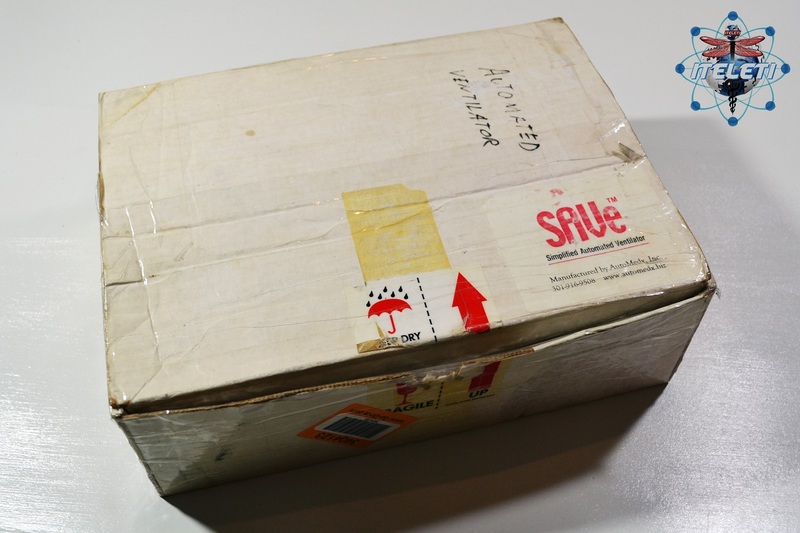 As such, we are able to pass the savings on to our customers by offering this AS-IS, in NEW Condition, with absolutely no signs of wear in original packaging but not sealed. We only verify and check that item is receiving the correct voltage and powers on. We have a SOLD OUT of these on dotmed.com. However, we do have a limited number available in stock which you can purchase from us on eBay by clicking here or through www.iteleti.com. Your purchase is made through PayPal on their secured and encrypted servers. Like the Gomco® 6050, the Thoracic Drainage Aspirator Gomco® 6053 is designed to reestablish vacuum within the pleural cavity following thoracic and cardiac surgery. With the Model 6053 you get to choose whether you want to use U.S. Standard Electric 115V or use 230V Electric. Whereas, on the Gomco® 6050 Model you purchase either or. It is my understanding that to date, the option to have both, well, it’s not an option. Which is fine for most users and is definetely a big plus for those that want that option. Provides regulation of suction drainage from 0 to 50 cm of water for rapid removal of fluids and gas from the pleural cavity. This pump offers high flow rates and a dual 2800 ml glass collection bottle system with two calibrated water seal tubes and two drainage tubes. A cap is provided when only one drainage tube is required. This unit is UL listed and CSA Certified. Shipping Weight = 78 lb. / 35 Kg. The Thoracic Drainage Aspirator Gomco® 6053 is a high performance mobile aspirator specialized for emergency thoracic drainage in hospitals. It generates up to -50 cm H2O of vacuum pressure with a 110 lpm flow rate at open flow. Vacuum Range is 0 to -50 cm H2O (0 to -36.8 mm Hg) with Flow Rate at 110 lpm at open flow. This is a sturdy, convenient, easy-to-use unit designed for mild intermittent and mild intermittent/constant drainage. It produces a gentle suction with minimum noise, and are capable of dependable operation over lengthy periods of time for post-operative care. The Sorensen 2590 (Noise-Free) Thermal Intermittent Surgical Suction Machine features a disposable, hydrophobic / bacteriostatic filter designed to protect both the pump and the ambient environment from aqueous or airborne bacterial contamination; as seen here. The Model 2590 by Sorensen is a post-operative mobile unit designed to deliver mild intermittent rise suction for use in abdominal decompression or drainage of the abdomen, bladder and other body cavities. It is ideal when either 90 or 120 mm of vacuum is required. Quiet, Mobile, Reliable, Lightweight, Dependable, Large capacity, Hospital-grade plug, Solid state construction, Sturdy and well balanced, Long lasting performance, Non-mechanical operation, Minimum repair or downtime, Automatic air vent overflow cutoff, Convenient built-in line cord storage, Disposable hydrophobic/bacteriostatic filter, Offered with a 2200 ml collection bottle, Automatic continuous operation (90 or 120 mmHg), Chemical resistant stainless steel space-saving top. Easy rolling 3” (8 cm) ball bearing caster with two locking ones, and is Designed for extended periods of continuous operation. Solid state construction offers automatic intermittent operation that’s so quiet that you’ll hardly know that it’s working. Non-mechanical operation delivers long lasting performance with minimum repair or downtime. SORENSEN MOBILE SUCTION APPARATUS MODEL 2590 Mobile Intermittent Thermal Drainage. You can download or view the Sorensen Model 2590 brochure on Impact Instrumentation Inc website located here is a great companion and is recommended even that it be used with the Wangensteen suctioning technique.